It is with great regret that I must advise you of the passing to a higher world of our Matriarch Emeritus Meri Spruit in the early hours of the 3rd of June 2014. Mother Meri has succumbed to old age after a noble lifetime of setting the example of how we as Clergy should try to attain. We in Australia have fond memories of both the Spruits and they certainly have created the standard we attain to achieve. R.I.P. Mother of Antioch Malibar Rite. 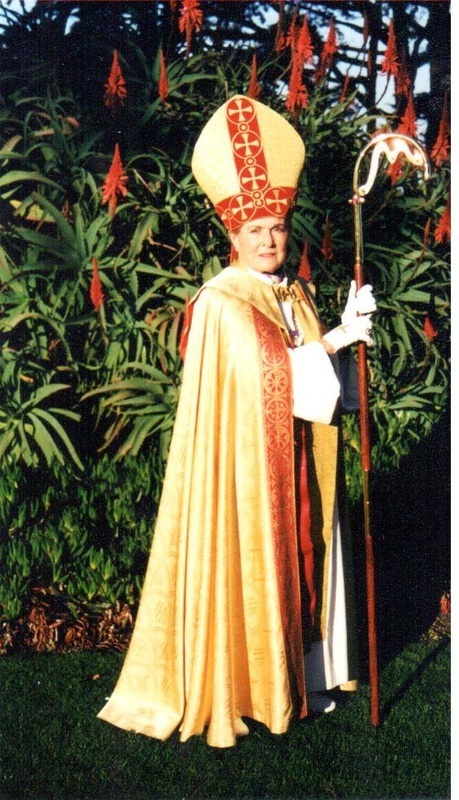 The crosier that Abp Meri Louise holds was made by Abp Frank Bugge after her visit to Australia in 1987 along with Abp Herman Spruit, to Consecrate both Abp Frank Bugge and Abp Chearle Bugge, to begin the journey of the Australian Church of Antioch. The M stands for Mother Meri Matriarch. In each point of the M are set 5 green stones on either side making 10 in total. Also 5 garnets are set into the M to represent N.S.E.W & Earth Air Fire & Water. NEWS! NEWS! & MORE NEWS! The four Archbishops of the Australian Church of Antioch after having met Rev Carrey Oliver and having been impressed with his demeanor, his genuine intent and his humbleness, put to the Synod that he was eminently suited to be be raised to the Episcopate. This shall be duly carried out tomorrow at 10.00am on Sunday the 21st of July 2013, in the private Chapel of the Presiding Archbishop, The Most Rev Frank Bugge. We ask for prayers for the journey of Rev Carrey Oliver from Sabah, Malaysia as he makes his way to Australia this week. 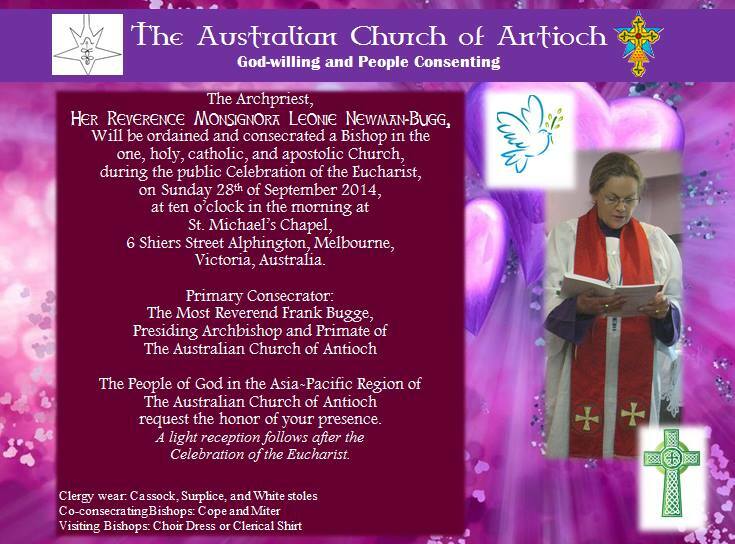 Rev Carrey has been invited to be officially inducted, by the laying on of hands, into the Clergy of the Australian Church of Antioch. Whereby genuine Apostolic Succession shall be unquestionably his right to claim. This shall take place at 10.00 on Saturday the 20th July 2013 in the private Chapel in Alphington of the A.C.o.A. Presiding Archbishop, the Most Rev Frank Bugge. 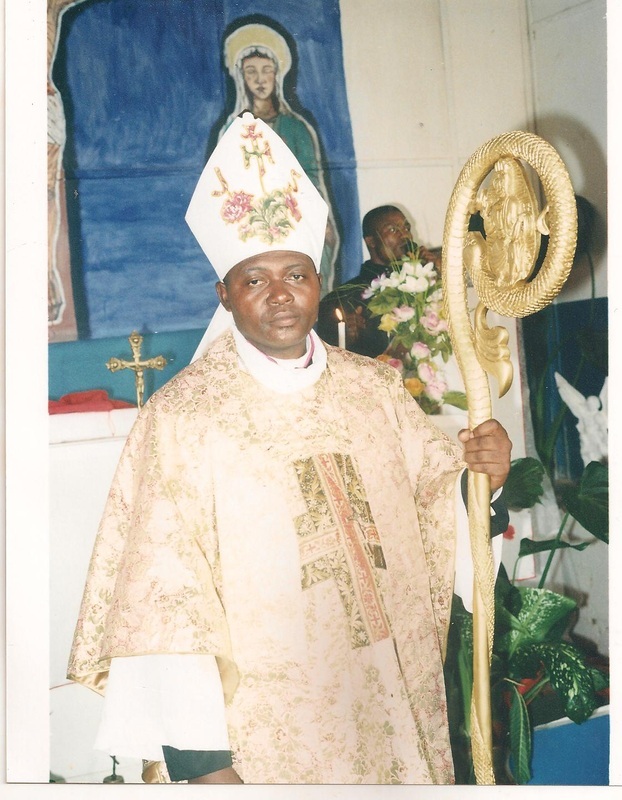 Negotiations with Bishop Desire Nomo Atangana (pictured) left, of the Liberal Catholic Church of Africa has reached a satisfactory stage where all documentation is now winging its way towards Africa for signing. Our constitution has been changed to accept this union as well as any possible future unions. Bishop Desire is of genuine Apostolic lines derived from the old Catholic line of Utrecht. Africa LCCA has several Priests and Deacons and is fertile ground for spreading the message of The Holy One. On 6th of may Wayne Budgen was ordained to the order of Monsignor (senior Priest). This was performed by the Archbishop of Tasmania ++Glenn Clark who is also the Dean of St Michael's Divinity School. Monsignor Wayne will be working in the Brisbane area carrying out his duties in his newly alloted pathway. We wish all the best to Mons Wayne as he travels his new road to his spiritual fulfillment. As of now we will soon be at the end of what is known as the Mayan calendar. In spite of what many think, the world will NOT end here, but we shall enter into the beginning of a new period of the Planet's evolution. This is exactly 144 years away from the second coming of The Christ. Let us refresh our attitudes and actions to that of higher levels, so that we all may be found in harmony with the Holy Angelic forces and be ready for advancement in the Army of The Lord. Lessons for advancement in God's army are simple, just --- DO WHAT YOU WILL BUT HARM TO NONE. This will guarantee you at least an interview for entry into the army of God. No person is exempt from the love of Christ our Lord.